Ohio Furnished Navy This QuartetThe Bluejacket quartet and its accompanist who appear every Saturday night on the "Men o' War" radio program heard over the Columbia Broadcasting System from the U.S. Naval Training Center, Great Lakes, Ill. 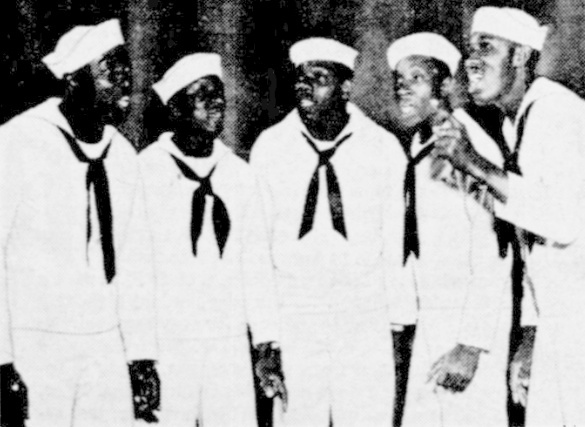 Above appearing from left to right are Seamen Second Class William Bryant, Durant Bryant, Wilbert Wellington, accompanist; Joseph Bryant, and William Graham. All hail from Dayton, Ohio, except Wellington, who is a native of Des Moines, Iowa.